We go back to basics with one of our favourite beauty procedures, HD Brows. Developed by internationally acclaimed, Nilam Patel, HD Brows is a treatment that concentrates on creating flawless shape and contouring, while promoting hair growth. The treatment, along with the specially formulated partner products can make you appear more youthful, enhance your natural beauty, add shape to your face and potentially ‘fix’ any previously, over-plucked brows. 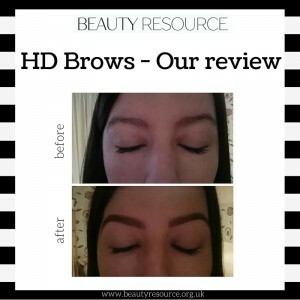 Beauty Resource team member, Sian, shares her HD brow experience. “For years I have always had my eyebrows waxed, but since growing out my fringe I felt like my eyebrows needed some extra attention. A few of my friends have recently had HD Brows and I thought to myself, “Why not? I may as well try it out too!”. I’m so glad I did as the results were amazing. First of all, the beautician talked to me about what I wanted to achieve. We discussed the shape, the colour and I explained I wanted quite natural looking brows as it was my first session. After measuring out my face to ensure the shape suited my face, she tinted them. Once the tint had been removed, she continued to wax them, thread them and tweeze any stray hairs. I was anxious about the threading as it’s not something I experienced before, but it was relatively pain-free – I suppose all those years of waxing have probably helped my pain threshold. She then started filling them in with brow pencil and shadows to really finish off the look. When she passed the mirror I was quite surprised. The tint had really highlighted hairs I never knew were there. They did look quite dark at first, but it was always going to be a shock as I’ve never had them tinted before. I soon got used to them and couldn’t stop checking them out in the mirror. They looked so ‘finished’, despite my inspecting them carefully to see if I could find any, there were no stray hairs to be found!